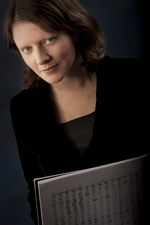 Natalie Williams is an Australian composer and United States permanent resident. Her works have been commissioned and performed by international ensembles, including the Atlanta Opera, Omaha Symphony, the Berkeley Symphony, the Melbourne Symphony Orchestra, the Adelaide Symphony Orchestra (read a review in The Guardian), Musica Viva, the West Australian Symphony Orchestra, Adelaide Baroque, the Sydney Youth Orchestra, the Australian Youth Orchestra, Indiana University Chamber Orchestra, and the Plathner's Eleven Chamber Ensemble (Germany). Major premieres include a string octet Saudade, commissioned as the first new work for the Hildegard Project, a multi-year plan initiated by Musica Viva Australia, supporting women composers in contemporary music. The piece was premiered by the Pavel Haas Quartet (Czech Republic) and the Doric Quartet, at the Sydney Conservatorium of Music. 'Williams has a spectacularly evolved gift for tapping into a universally shared pathos that speaks to an audience, even on a single hearing, with profundity and depth. Natalie Williams has duly written a deeply poignant, thought provoking, and richly expressive work', wrote the Limelight about the premiere of Saudade. Natalie Williams's orchestral works have received critical acclaim, including the premiere of her first symphony Our Don by the Adelaide Symphony Orchestra on August 14, 2014 - a multimedia orchestral tribute to Sir Donald Bradman AC. 'Composer Natalie Williams's portrait of the Test cricketer [Sir Donald Bradman] is as rewarding as the sound of leather on willow, after a delightful performance...' (The Guardian, August 15, 2014). Her orchestral output includes fifteen orchestral commissions from ensembles including the Melbourne Symphony Orchestra, Adelaide Symphony Orchestra, West Australian Symphony Orchestra, and the Adelaide and Sydney Youth Orchestras. In May 2015 her doctoral dissertation was chosen for performance within the American Composers Orchestra EarShot reading sessions with the Berkeley Symphony and was also chosen for the Omaha Symphony New Music Symposium in 2012, mentored by maestro William Bolcom. She was the youngest Australian composer commissioned by the West Australian Symphony Orchestra to compose a Fanfare for their 75th anniversary concerts in 2003. In 2005, Natalie was commissioned by the Melbourne Symphony Orchestra and the Cybec Foundation for a new work in the Metropolis New Music series, which was also premiered to critical acclaim. Her music has been championed by performers and toured throughout Europe (Stephan Ammer and Gintaras Janusevicius, piano, and Peter Handsworth, clarinet), Australia (Mark Kruger, piano) and the United States (Duo Fujin). She has worked with composers such as Philip Glass, William Bolcom, Peter Sculthorpe, Brett Dean, Narcis Bonet, Claude Baker, Don Freund, Robert Beaser, Brenton Broadstock, Aaron Travers and Graeme Koehne, and conductors Martyn Brabbins, Joana Carniero, Thomas Wilkins, James Judd, Benjamin Northey, Kevin Field and Professor John Hopkins. Her output includes music for film, theatre, chamber, dance and orchestra. International composition festivals that have presented her music include the Florida State University International New Music Festival, the International Trumpet Guild new music recitals program, the Midwest Composers Symposium, the Society of Composers Inc., national conference and the Melbourne Symphony Orchestra's Metropolis New Music series. A two-time winner of the Atlanta Opera Competition (2013 and 2015), and winner of the Iron Composer competition (2010), Natalie was also the joint winner of the inaugural Schueler Awards for Orchestral Composition, resulting in Whistleblower, an overture commissioned for the Adelaide Symphony Orchestra and premiered to an audience of 30,000 in February 2007. She won the Region 5 division of the ASCAP/SCI composer awards in July 2011 (United States) and the Chicago-based, Renovo String Orchestra composition competition for performance in their 2012 season. Other prizes include the Australasian Performing Rights Association, Professional Development Awards (Classical category) in 2006, the Lyrebird Commission from the British Music Society in Melbourne (2006) and an overseas study scholarship from the Opus 50 Charitable Trust (Melbourne). Academic teaching positions include; the Indiana University Jacobs School of Music, the Hugh Hodgson School of Music at the University of Georgia, and the Faculty of Music at the Melbourne Conservatorium. Natalie completed her Doctorate in Composition at the Jacobs School of Music as a four-year doctoral fellow. Further academic training was completed with the UK Society for Music Analysis at Durham University in 2010 and studies at the Ecole Normale de Musique (Paris) summer school in July 2007, with the European American Musical Alliance. She is a fully represented composer at the Australian Music Centre, a member of the American Composers Forum and the Australasian Performing Rights Association. Natalie also serves on the selection committee for the Fulbright U.S. Student Program, on the Society of Composers Inc. board as the current Student Chapters Coordinator, on the board of the International Alliance for Women in Music, and as an adjudicator for the MTNA State-level composition competition for California. Talking points : miniature suite for viola and piano (2016) Commissioned by Stephanie Farrands.